FAQ › Rottweiler Klub of North America Inc.
As of 2018, owners whose dogs pass an RKNA Inc. SE under an ADRK judge can also apply for ADRK BSE certification. WHAT ARE THE RKNA REGIONS? HOW DO I GET AN ADRK SCOREBOOK? ADRK scorebooks are available to RKNA Inc. members an application can be found in the document library. DO I HAVE TO BE AN RKNA MEMBER TO SHOW OR TRIAL AT AN EVENT? 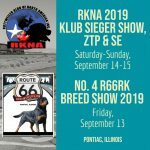 RKNA membership is not required to attend an RKNA conformation show. If trialing, current membership card for organization scorebook is issued by and the original scorebook must be submitted to Trial Secretary. For breed tests, proof of titles is the dog’s original scorebook and proof of current membership is required from the organization the scorebook is issued by. You must be an RKNA Inc. member to enter a ZTP or Advanced Breed Survey. For breed tests, proof of titles (min BH) is the dog’s original scorebook and proof of current membership is required from the organization the scorebook is issued by.